Despite being known internationally as a luxurious winter ski vacation destination, St. Moritz in Switzerland began as a summer resort. In the 19th century, Europeans flocked here for the healing springs. From the earth flowed a cold, iron-rich, carbonated water believed to have therapeutic benefits and promote fertility, which made it especially popular with honeymoon couples. That same spring still gushes forth today, and visitors find it just one of the many wonders of this magical mountain village that boasts 322 days of sunshine a year. St. Moritz includes both St. Moritz Bad, the lower part of the village where the springs originate, and St. Moritz Dorf, the mountain village. And it's just a 3.5-hour drive from Zurich, unless you take the Glacier Express, billed as the “slowest express train in the world”—and perhaps its most scenic. Summer brings honeymoon couples and others who appreciate cool, breezy nights, fresh and dry air, no fog, and plenty of lakes and springs to swim. A huge swimming pool was being built when we visited. Winter sports started in St. Moritz in 1878: vacationers devised them to avoid boredom. Any time of year, these are the top places and activities for couples in love. Ready to take on the challenge of a 3000-meter (or higher) mountain? St. Moritz is ringed by them. Corviglia is the largest and sunniest of the ski areas; Corvatsch, at 3300 meters, is the tallest. Slopes are wide and start above the tree line, offering long, exhilarating runs. Instructors are available. If this isn't your sport, it's still worth taking the cable car to the top to take in the panoramic views. Although your budget may not yet allow for diamonds and designer fashions, you can still eyeball the latest styles in St. Moritz. Do some window shopping along the town's two main roads, Palace Street (across from Badrutt's Palace hotel) and Via Maistra. Many of the top luxury brands maintain boutiques here. Among them: Bulgari, Tom Ford, Bottega Veneta, Chanel, Louis Vuitton, Prada, Cartier. Too rich for your blood? Stop in at Läderach chocolatier across from the Palace hotel and have them break off an affordable piece of the chocolate bark for which they are justly lauded. Ever wanted to whoosh down a mountain, holding each other tightly? From the St. Moritz Bobsled Club you can hop onto one of the sleds, a driver in front and a brakeman behind, to get an exhilarating taste of the sport. The St. Moritz Bobsled Club builds its own track every year, and enthusiasts appreciate that they get to speed down a new course each winter. Born in 1858, the painter Giovanni Segantini was known for his large Alpine landscapes. Several of them are collected in the circa-1908 Segantini Museum and the stone cupola of the structure, which displays his best works under the dome. The space can also be used for non-denominational wedding services; tennis champ Boris Becker held his ceremony here. Event capacity is 50 people. Cuddle together under a warm wrap as your driver leads his team of horses through small Alpine villages and across snowy fields. You'll even pass the Nietzsche House in Sils, where the German poet and philosopher spent his summers resting and writing. Hanselmann Cafe, just off Schoolhouse Square, is the place to quaff a cup of the rich brew. Did you know the art of creating solid chocolate candy began in Switzerland? Before that, aficionados consumed it only in liquid form. We'd mainline it. If you crave something more substantial, try Talvo restaurant. A traditional Swiss structure, it's decorated with scratchitti and its small windows were designed to keep the cold from seeping in. Even if you're not religious, Regina Paces Church has the best view of this scenic village, and that's saying a lot. It overlooks the lake and Upper Engadin valley. There's also another church worth seeing, the leaning tower originally erected 1139; it's located at the tallest point in town. Just keep walking or driving up; you can't miss it. 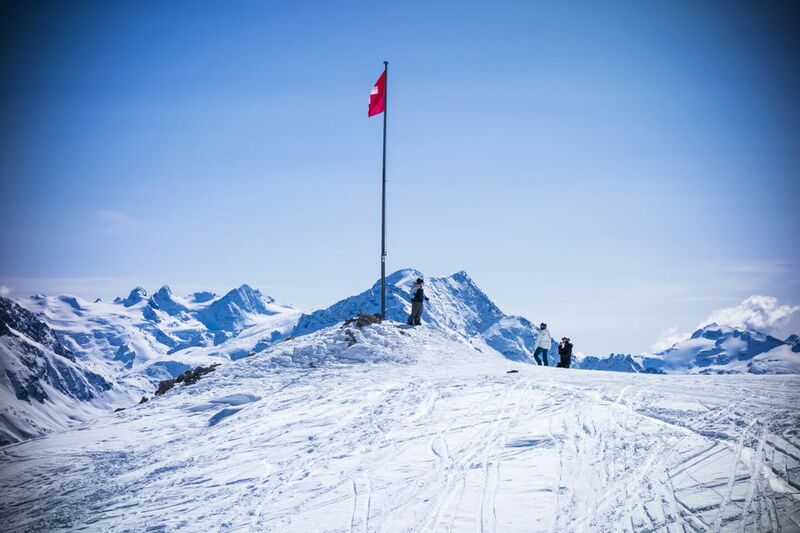 The permanent population of St. Moritz is 5,000; it swells to 25,000 in ski season. Yet it maintains five five-star hotels: The Kempinski, closest to the springs; Carlton, a modern all-suite property designed by a leading Italian stylist; Kolm, across from the leaning tower, the city's oldest and most traditional hotel; Badrutt's Palace; Sulvetta, the most formal and upscale. Males (even boy children) at the latter are required to wear a black or blue suit at dinner. The same spring that drew the first tourists to St. Moritz still gushes forth today, and visitors believe it a tonic for counteracting anemia, skin and teeth problems, and digestive disorders. And it is just one of the many natural wonders of St. Moritz Bad, the lower part of the village where the springs originate. Nightbirds enter Dracula, the dark-themed nightclub at the Bobsled Club, through a snow cave. Looking for jet set action? Check out King's Club inside Badrutt's Palace. Its Renaissance Bar/Davidoff Lounge is an alternate venue for smokin' action. And if you've got an urge to try your luck, there's a small casino in the Kempinski Hotel. St. Moritz isn't large, but if you want to know about it from a native, your hotel can arrange a local tour guide for you. We saw the sights with the ebullient Mario Haefliger, a longtime resident, who can fill you in on the history, sports, and much more in this dynamic, glittering, and romantic village.